Make our population safer by removing hazardous materials from indoor and outdoor sites, preserving natural resources, preventing pollution, and protecting the environment. Too often than not, attention given to the environment is reactive as opposed to proactive. Even in our work, we offer clean-up, removal, and demolition. Although our team can certainly help with these and are experienced in this work, we are looking at 2018 with an opportunity to be just a tad more proactive. 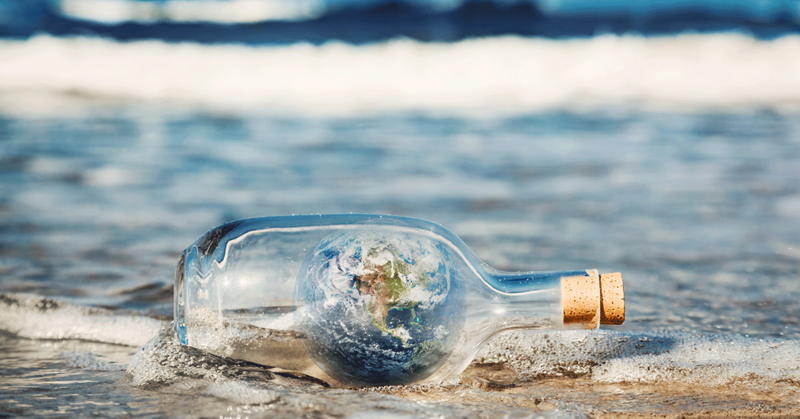 Here are 3 ways we as a community can be more environmentally proactive in 2018. Plan for Asbestos Remediation | Yes, we know removing asbestos is typically a reactive activity, but there is an opportunity to be proactive in planning for and removing it in safe and effective way, as opposed to waiting until something and/or someone disturbs it and it becomes a hazard. Schools are mandated to have an asbestos removal plan in place, continuously making effort to mitigate asbestos each year and/or as resources allow. This is an initiative that can and should be adopted for commercial and residential properties where it is known or suspected that asbestos exists. Prevent Mold | The key to mold prevention is moisture control and although there are numerous ways to control moisture, identifying problem areas, drying any wet areas immediately, and ensuring proper ventilation are three fundamentals. Problem areas may include a basement that floods or areas where condensation is prone such as a poorly ventilated bathroom. One way to instill the area is kept dry is to make sure that any appliances have vents to the outside, or that exhaust fans are in place and working to deplete any moisture. If vents are not prevalent, use a dehumidifier to aid in the war on moisture control. Survey Demolition Sites in Advance | When it comes to interior or select demolition projects, it is wise to either conduct a survey in advance to determine what may lie hidden within the walls and/or have an environmental professional on-site during the demolition to help secure the site and identify and remediate any potentially hazardous materials should they be present. Of course, there are so many ways to be proactive when it comes to the environment and hopefully this quick hit list might spark an idea or two for keeping the community-at-large safe from hazardous materials found within our homes, offices, or schools. Should you need help with mold remediation, asbestos removal, and/or interior or select demolition, please contact Banner Environmental Services. We provide environmental services to all of Rhode Island and Massachusetts, including Cape Cod and the Islands. There are elements of our natural world that are sweet and pleasant, while others tend to be more detrimental. With the negative health effects… mold happens to fall closer to the later. Molds are part of the natural environment in which we live. Outdoors, mold plays an active role to break down and decompose dead, organic matter such as fallen leaves, dead trees, and other vegetation. This is important in the regeneration of soil and the natural cycle of organisms. However, indoors, mold has no true responsibility or proposes, and in fact, can have serious negative health impacts. There are several types of mold, and it can appear in several different colors. Molds produce allergens, irritants, and potentially toxic substances (mycotoxins) that, when inhaled or touched, may cause reactions. Some responses include hay fever-like symptoms such as sneezing, running nose, red eyes, and rash. People with asthma can suffer an asthmatic attack when confronted with mold. The most common types of mold include aspergillus, cladosporium and stachybotrys atra (black mold). Aspergillus is an allergenic mold that is commonly found on foods and in home air conditioning systems. Cladosporium is typically a black or green “pepper-like” substance that grows on the back of toilets, painted surfaces, and fiberglass air ducts. While this type is non-toxic to humans, it can trigger common allergy symptoms, such as red and watery eyes, rashes and a sore throat. Mold that appears to be orange or red in color is typically found outdoors, given its nature to thrive on decaying plants or moist wood. This type, which can appear slimy, is harmless and should only be removed for aesthetic purposes. So how does it get inside your home in the first place? Molds reproduce by tiny, spores that are invisible to the naked eye and can float through the air. It can begin growing inside when the spores land on wet or moist surfaces, bear in mind that surface may be hidden, such as inside of a wall, cavity or cabinet. If you suspect mold or need help to remedy it, we can help. Contact us here or call 866-934-2374 for a free consultation. The key to mold control is in moisture control. 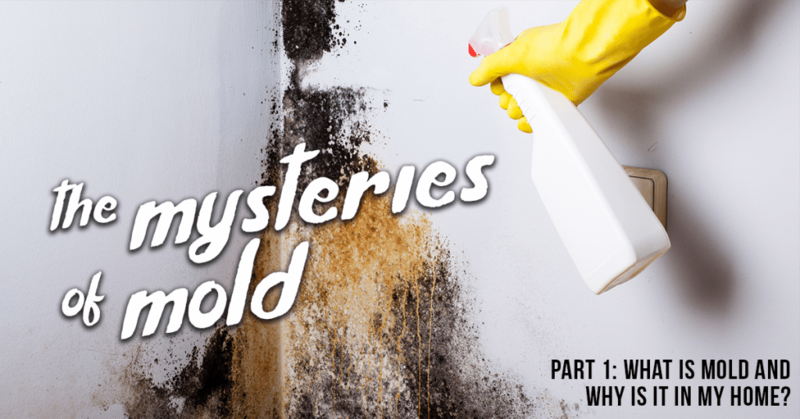 In Part 2 of our series, we will uncover ways to remove mold and keep it from returning. 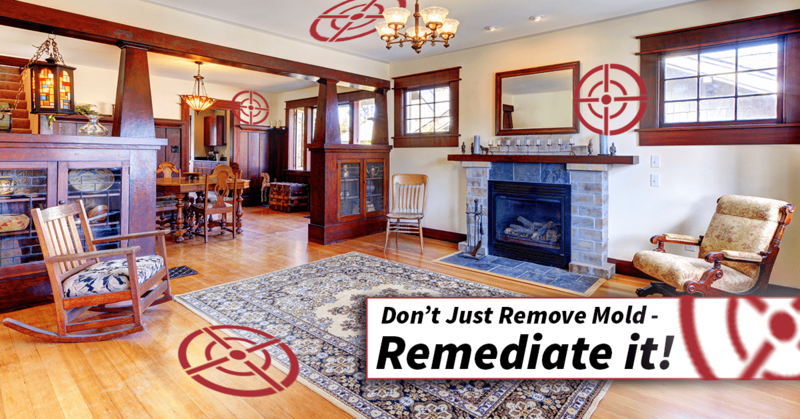 Don’t Just Remove Mold, Remediate it! Just because you can’t always see mold – doesn’t mean it is not there. Mold can grow outdoors, indoors, and virtually on any surface where moisture is prevalent. That means it’s capable of being hidden inside walls, pipes, wallpaper, on or underneath carpets, and more. If there is any speculation of mold’s presence, determining if it actually exists is the necessary first step. There are several different types of mold, but no matter which type may exist in your space, you will want to remove it as soon as possible to prevent any potential health risks for those exposed. And although removing the mold is important, it is also equally important to eliminate the source of moisture to prevent the mold from simply growing again. Reducing humidity, implementing proper ventilation, and cleaning and drying all surfaces are just some of the many ways you can help to remediate the mold problem. Sometimes the mold problems can be an ongoing nuisance, bigger than one can bear, or just downright stubborn. Should that be the situation, our team is always properly equipped, trained, and ready to handle such projects. Our team’s responsiveness, professionalism, and ability to provide top-notch service are just a few of the many attributes you will experience when working with us. For more on mold clean-up, removal, and remediation – click here. Want to know more about mold? Check out this list of ten things you should know about mold, published from the EPA.